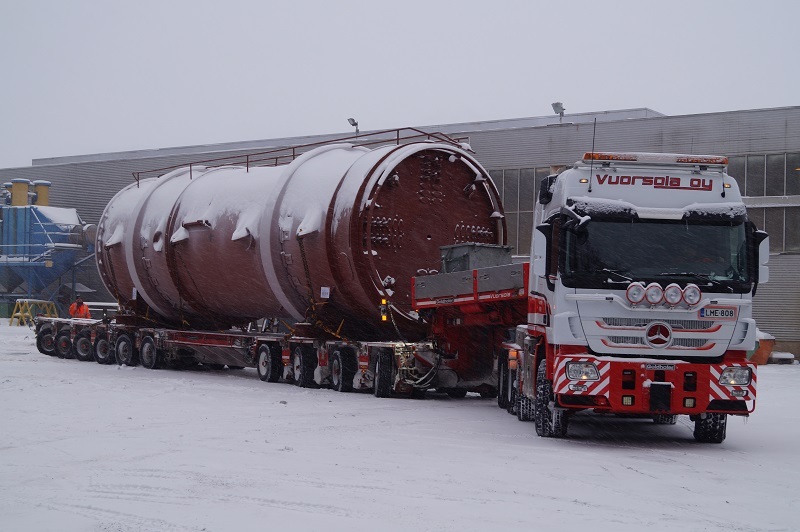 Hacklin Logistics (members in Finland) picked up the photographed drum assembly on a snowy and windy day in January. The piece weighed 116,300kg with dimensions of 13.60 x 4.10 x 4.13m. On the date of the shipment, there was heavy snowfall throughout the night and the truck had to wait for ploughs to work the site before loading. A request for additional road plough maintenance was also placed in order to be able to deliver the cargo to port. Once clear, it was delivered to Mäntyluoto Harbour at the Port of Pori in Finland where it started its sea journey on the Hacklin Seatrans vessel to Hamburg, Germany. On arrival, the cargo was transshipped to a tramp vessel to take it to its final destination.